If this were a different present, Tarkir would be in the clutches of five powerful khans. The deserts and the forests would be rife with bloodshed and plagued by war. The clans would be locked in battle for control of immense fortunes and vast kingdoms. But this is not that present. This present was never the khans' to rule. This present belongs to the dragons. The mighty dragons of Tarkir owe their existence to Planeswalker Sarkhan Vol. From a dragonless present, he travelled back in time more than a thousand years to a crucial turning point, and there he saved Planeswalker Ugin, the Spirit Dragon, from death. In doing so he ensured the continuing presence of the dragon tempests, the storms that feed on Ugin's magic and birth dragons, and thus he ensured the continuing presence of dragons. For many years, the clans had been fighting a war against the dragons for their own survival, hoping to gain some advantage in the struggle. But that hope was dashed when Sarkhan intervened. With the dragons' presence secured, draconic numbers grew and soon, the tide of the war turned. Ultimately, the dragons were able to hunt down the khans and destroy them. Then all that was left was for the dragons to claim their place on the vacant thrones. In this present, the defeated clans are ruled by five legendary dragonlords. Over time, the clans have come to embody the predominant aspects of their draconic masters, and they represent these strengths with draconic symbols. Each clan battles with mana from an allied color pair, wielding its magic on behalf of its dragonlord in a bid to gain control of the entire plane of Tarkir. The Tarkir of Sarkhan Vol’s birth is a world driven by battle. The plane is dominated by five powerful clans that vie for supremacy in a land where dragons have been hunted to extinction. Led by the five khans, the clans clash with each constantly. Each khan seeks to win territory from the others—and some wish to rule it all. Over a thousand years before the present day, the skies of Tarkir teem with dragons. They spawn from mighty elemental storms, fill the sky with their destructive breath, and terrorize the five warrior clans. The clans fight a war against the dragons for their own survival, hoping for some way to gain an advantage in the struggle. Among the clans of Tarkir, the Sultai revered ruthlessness above all other virtues, building a reputation for cruelty and deception. As history would prove, deception trumps cruelty. The reign of the Sultai's last khan, Tasigur, was cut short when Ikra Shidiqi, his naga advisor, betrayed him to the dragonlord Silumgar. Silumgar rewarded her act of treachery by making Ikra his first dragonspeaker. Ishai is the personal attendant of Ojutai, a wise and ancient dragonlord of Tarkir. Ojutai has had many heralds and holds no personal attachment to any of them, but Ishai's years of service have gained her a great deal of autonomy. Ishai's word carries the authority of Ojutai, and she demands the full respect of her clan. Over a thousand years ago, the khan of the Abzan surrendered to the dragonlord Dromoka as Reyhan watched. That act of supplication was meant to end the Abzan clan, but Reyhan refused to kneel to a dragon. Reyhan rallied the remnants of her shattered clan and became its final khan. During the khanfall, the last battle against the dragons, Reyhan died protecting her fellow khans. The denizens of Tarkir are all too familiar with the destructive power of dragonfire, and Vial Smasher, a goblin of the Kolaghan clan, is no exception. Brash and fearless, she has spent a lifetime handling—and smashing—vials of this dangerous substance. In another timeline, with another name, the planeswalker Sarkhan Vol considered her a clan-mate and a friend. The dragonlord Dromoka is, in equal measure, a merciful and imperious leader. An ancient and powerful dragon, she has earned every inch of the territory she commands. In battle, she does not hesitate to unleash her breath weapon, a beam of scouring light, to obliterate those who dare stand against her. The dragonlord known as Ojutai is ancient, insightful, and wise. The truth of how he came to dominate the clan that bears his name has been lost in the mists of history. Known as the Great Teacher, Ojutai spends long afternoons in his roost at Dragon's Eye Sanctuary, holding forth on spiritual and intellectual affairs. The dragonlord Silumgar dwells in an opulent temple-fortress surrounded by an army of dragons, mages, and undead. He enjoys provoking fights among his servants, as he gets pleasure out of both the battles themselves and the resulting zombie servants, which he can then add to his horde. Feral and brutal, the dragonlord Kolaghan enjoys the hunt and the kill more than the resulting meal. Unlike the other dragonlords, Kolaghan doesn't speak, even in Draconic. There is nothing she wishes to say that she can't express with bursts of destructive lightning or slashing claws. The ultimate predator, Atarka spends her days, and most of her nights, hunting and feasting. To her, life is an eternal banquet and she the lord at the head of the table. When she is not eating, she is either considering her next meal or stalking it. There is nothing she will not devour, including those in her own clan. Anafenza was a capable warrior and talented leader who was executed for kin-tree worship. Since then, Dromoka's armies report seeing a ghostly figure fighting alongside them. Dromoka disavows the existence of Anafenza's spirit, but remains always alert for kin-trees. The naga Sidisi was once one of Silumgar's interpreters, until the paranoid dragonlord had her executed...and raised as a zombie. In her life after death, Sidisi has been able to rally the naga and gain the allegiance of a large number of sibsig zombies. A huge orc with a short temper, Zurgo sleeps shallowly, camping out at Kolaghan's side, always alert for the slightest movement of the dragon. For when Kolaghan stirs to battle, it is Zurgo's job to sound the alarm. He strikes the clan's dragonbell with his greatsword, rousing the warriors to fight. A skilled leader and unrivaled hunter, Surrak knows that he is expected to kill and deliver any target his dragonlord selects. The more challenging the target, the more pleasure Surrak takes in the hunt. While others in the Atarka clan hunt as a means for survival, Surrak hunts for glory, honor, and most of all for fun. The Dromoka are a true community, dragons and desert survivors bound together by their common allegiance to their devoted dragonlord. The clan embodies the draconic aspect of endurance, and their symbol, fittingly, is the dragon's scale. They march in close ranks and fight with the support and cooperation of dragons. While most on Tarkir bow to their overlords out of fear or awe, the monks and mystics of the Ojutai clan submit out of respect and a desire for knowledge. The clan seeks to learn how to truly embody the draconic aspect of cunning, and has taken the dragon's eye as a symbol to represent this quest for enlightenment. 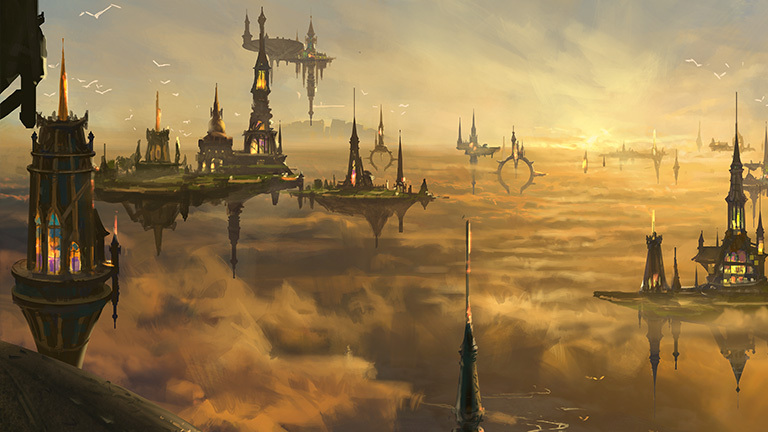 Of the five dragonlords on Tarkir, Silumgar has the fewest followers—living followers, that is. When the undead are taken into account, his clan's numbers are unrivaled. The clan unapologetically embodies the draconic aspect of ruthlessness, as represented by their symbol: the fang of the dragon. Reckless and unpredictable like their dragonlord, the Kolaghan take what they want when they want it, including power and dominance within the clan. No matter what their target, the Kolaghan strike with the brutality of lightning. Their speed and volatility are represented by their symbol: the dragon's wing. Provide or become the provisions. This is the way of the clan serving the eternally hungry dragonlord Atarka. As a result, those left alive are among the most brutal and ferocious hunters Tarkir has ever known. The Atarka's unmatched savagery is represented by their symbol: the razor-edged claw of the dragon. Muscular and savage, orcs are well suited to Tarkir's harsh environment. The Kolaghan clan includes many orc warriors. Orcs also share the wild lands of the Atarka. Djinn inhabit the highest parts of Tarkir, especially the mountains where the Ojutai have their strongholds. With their inherent ability to fly, combined with superior athletic skill, djinn are masters of martial and mystical styles. These beings of elemental fire hail from remote mountains called Qadat, the Fire Rim. They lend their natural incandescence to the Atarka clan, fighting for the clan as fierce warriors. The snakelike naga are descended from Sultai leaders who made dark deals with rakshasa. Now they serve the dragonlord Silumgar and his clan. Naga are infamous for their cruelty and expertise at magic that warps both mind and body. The birdlike aven are numerous in Tarkir's skies. Their keen eyes and tireless wings make them ideal attendants for the dragons of the Dromoka and Ojutai clans. Among the Silumgar, vulture-aven scavenge the dead. There were once aven shamans among the Temur, but the dragonlord Atarka drove them out. Tarkir was once home to two lineages of the canine humanoids called ainok. Those of the desert wastes are masters of survival; many of them belong to the Dromoka clan. The bearlike mountain ainok are all but extinct, hunted by the dragons of the Atarka clan, but some desert ainok have adapted to life in the mountains. Narset is a learned monk and one of the favorite students of her dragonlord, Ojutai. Narset channels her inner will to give her mastery over the physical and spiritual world. She is also one of the few who know the true history of Tarkir. Excluding Nicol Bolas, this vampire is older than all the other Planeswalkers combined. Though he’s a master of blood magic, Sorin has a surprisingly virtuous streak. Ugin is a powerful and ancient dragon planeswalker. Able to shift matter into energy, Ugin has found power using magic others would not have thought possible. He plans to study the multiverse and the greatest mystery he has encountered — the Eldrazi. Travel back in time to a war-torn Tarkir where five clans clash with the mighty dragons of the past. The choices made now will decide the fate of Tarkir.